I am trying to figure out what Ralph Glidden found on Catalina Island. Did Ralph Glidden find bones of giants on Catalina Island? Ralph Glidden was digging on Catalina Island in the Gulf of California between 1919 and 1928. He found, according to newspaper articles, numerous skeletons 7 to 9 foot tall. But where are those skeletons today? Was it just a publicity stunt - or did he find the remains of a lost race of human giants? Channels Islands off the coast of California in USA, just an hour by ferry from Long Beach in Los Angeles city. It is 22 miles (35 kilometres) miles long and 8 miles (13 km) across at it widest. The island is quite rocky and the highest point is 2,097 feet (639 m). The Channel Islands has the earliest evidence for seafaring in the Americas, and also earliest evidence of humans in North America. Ralph Glidden was an amateur archaeologist who uncovered ancient burial sites on Catalina Island from 1919 to 1928: it is said that he excavated more than 800 grave-sites from about 100 individual locations around the island. 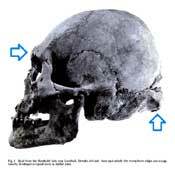 In addition to finding thousands of artefacts he also dug up almost 4000 human skeletons. He claimed that there once had lived an ancient race of tall and fair haired Indians on Catalina Island and the adjacent islands. Most of all the male adults were around 7 feet (2.20 m) in hight, and largest skeleton he found was 9 feet 2 inches (2.80 m) tall. Glidden lost his sponsor after digging for almost 10 years and the general opinion today is that he then was bluffing about finding giant skeletons to create interest and make money. Well, might be, but I'm not so sure! 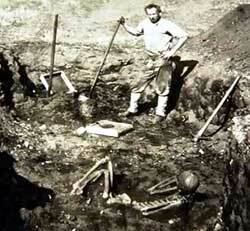 Ralph Glidden was not the first to find a giant skeleton on Catalina Island. 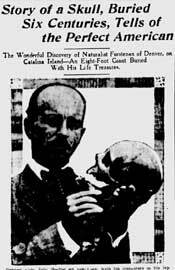 According to Pittsburgh Press July 20, 1913 and also Daily Telegraph on July 26; a German naturalist named Dr. A.W Furstenan unearthed an 8 foot skeleton on the island. The skeleton was found with artefacts such as mortars, pestles and arrowheads; all different from ordinary Indian relics. Plus a strange, flat stone, bearing unknown symbols. Furstenan had while in in Mexico heard a legend of a noble race of giants that had lived on Catalina Island long before the white man had arrived - and travelled to the island to investigate. He found the skeleton along Avalon Bay, in black, hard sand showing signs of burning. Most of the bones crumbled to dust when they came up in the air; only the skull, jawbone and bones of one foot remained. It is not only on Catalina Island it seems to have been found giants skeletons, there are reports of findings also on other of the Channel Islands. According to newspaper articles Santa Rosa Island was the site of a dig in 1959, and they discovered several skeletons more than 7 feet tall. The tops of the skulls were painted red. The skulls were said to be of "primitive", "otamid" type; most often described as having sloped forehead, pronounced brow, robust bones, powerful jaw, and a so called "inca bone" at the back of the skull. They were also said to have double rows of teeth. The skeletons were found at an Indian cemetery that contained abalone shells that were dated to be more than 7.000 years old. According to the book "The Native Races of the Pacific States of North America" (a five-volume description of indigenous ethnic groups) by Hubert Howe Bancroft a Mr. Taylor from San Buenaventura stayed at Santa Rosa Island in 1861 and he often came across skeletons of Indians in caves with double rows of teeth. Santa Rosa Island is the second largest of the Channel Islands of California, about 150 km northwest of Catalina Island. Also on San Nicolas Island west of Catalina there shall have been found large skeletons. In 1897 a party of relic hunters stayed three weeks on the barren island and Newark Daily Advocate tells about "Bones of a Giant Race on San Nicolas Island". The party found 87 skulls buried in the sand but only three were secured entirely. They found evidence that the island had been inhabited of two or more different races; "one of which was of great size". The newspaper writes that one of the most interesting relics was part of a skeleton of a large man with a long bone spear point sticking in his bones. In the shattered skull was a stone that been used as a war implement. In 1960, archaeologists discovered the remains of 13,000 year-old Arlington Springs Man, among the oldest human remains in the Americas, on Santa Rosa Island. Ralph Arthur Glidden was born in Massachusetts in 1881 but 15 years old he moved to Santa Catalina Island with his parents. He worked first as a carpenter but took early an interest in Indian artifacts. The story is that he was searching for pearls of barren San Nicolas Island when he happened to stump his toe on a skull: "I became so fascinated by my find that I have devoted my life to this work ever since". In 1915 he started to excavate Indian sites on San Miguel and San Nicolas Islands together with A. Taschenberger and Captain A. P. Chappel. Three years later Glidden sold his collection to the Heye Foundation of the Museum of the American Indian in New York. The chewing gum magnate William Wrigley, Jr. bought a controlling interest in the Santa Catalina Island Company in 1919. He improved the island with public utilities, new steamships, a hotel, the Casino building, and extensive plantings of trees, shrubs, and flowers. Wrigley also wanted to ensure that all artifacts found or excavated on the island should belong to museums, and in 1919 he granted the Field Museum of Natural History of Chicago exclusive rights to all artifacts gathered on the island. The museum contracted Heye Foundation to do all digs and Ralph Glidden was chosen to conduct all excavations. This Skeleton of a Man Who was 7 Feet 8 Inches Tall Reposed Below the Tomb in which the Remains of 64 Children Were Found. During the expedition to the interior of Catalina Professor Glidden collcted the skeletons of 3,781 Indians. The largest he found was a man 9 feet 2 iches tall. Practically all the male aldults were of gigantic stature, averagig 7 feet in hight. A report just published in the San Diego Union gives some details of an announcement by professor Ralph Glidden, curator of the Catalina Museum. He claims overwhelming proof that a fair skinned, fair haired, highly intelligent race of great stature lived on Catalina Island, off the southwestern coast of California, perhaps three thousand years ago, and that his excavation of a huge cache of skeletons, domestic utensils, urns, wampum, etc., is quite out of the ordinary class of Indian discoveries. A skeleton of a young girl, evidently of high rank, within a large funeral urn, was surrounded by those of sixty four children, and in various parts of the island more than three thousand other skeletons were found, practically all the males averaging around seven feet in height, one being seven feet eight inches from the top of his head to the ankle, and another being 9 feet 2 inches tall. Ceremonial stones, scratched with the sign of the cross, show Spanish influence. Skull of a giant Indian who was seven feet tall. Ralph Glidden was digging on Catalina Island between 1919 and 1928. He found, according to newspaper articles, numerous skeletons 7 to 9 foot tall. In 1922, the Heye Foundation reduced it's funding to Glidden and in April of 1924 cut all money for excavation of the islands burial sites. In resent articles about Glidden we can read the following: "Desperate for money, public attention and respectability, he later opened a "museum" dedicated to his research. Utilizing skeletal remains as a macabre form of decoration, the museum's unsettling interior attracted hundreds of tourists and was, in Glidden`s own words, "unlike anything else anywhere in this country." Well, "Catalina Museum of Island Indians" overlooking Avalon's harbour was definitely something else. It was a makeshift museum, basically a large tent - filled with bones and artefact. It was based on the famous bone chapel in Malta, using the bones he had dug up as decorative elements. Long bones were shelving support and brackets to display skulls and objects like ceramics, rugs and native jewellery, while window frames were decorated with toe and finger bones. It cost 35 cents to get inside. But what should he do? Even if the discovery of Tutankhamen's tomb in 1923 gave Glidden a boost of interest and visitors he had not enough income in the long run to keep on doing what he really wanted to do: Excavate more. Today many people are shocked over Ralph Glidden's lack of respect for the dead, but it was not so shocking then. He was far from the only person digging up ancient bones, often hoping to find valuable artefacts. And as we understand from Malta and simular chapels in Italy, even the church accepted the use of bones as decorations! Ralph Glidden claimed that he had uncovered a secret history of Catalina Island, that he had found evidence of a race of giants; a prehistoric race of blue-eyed and blond haired native Americans. In 1930 he announced that he had found the skeleton of a royal princess. She was buried in a large urn and around the urn 64 children was buried in four tiers. Five feet below the urn and children he found a skeleton of a 7 feet 8 inches (2.34 m) tall man. Glidden was now ready to sell his collection and also the whole secret of the island. We can read that he required an annual annuity for life, funding for five expeditions, and the necessary financing for various planned publications that included a large monograph chronicling all of his excavations. But nobody wanted to buy and in 1962, 81 years old, he sold his collection for $5,000. Ralph Glidden was of course not digging all alone on the islands. He had a crew of workers and now and then he was working together with other archaeologists. Well, he had no education as an archaeologist himself, and even if he sometimes was called Professor or Dr. Glidden, he himself seems to have used the titles Collector and Curator. When Glidden unearthed a giant skeleton on Catalina Island he was working together with Ernest Windle. He was the judge on the island, so it is hard to believe that he was lying when he wrote that the giant was seven feet two and one-half inches tall and must have weighed in the neighbourhood of 300 pounds! Kay Brown, a young odontologist, was Glidden's assistant in many of the digs. In her collection of 35,000 teeth from the sites on the Channel Islands there were only 12 teeth that were unsound and may have caused pain. We have mentioned A. Taschenberger and Captain A. P. Chappel; they spent four month with Glidden on remote San Nicolas searching for Indian artefacts. A collection of some 900 pieces, including skulls, mortars, pestles, arrowheads, war clubs, knives, spears, smoking pipes, a whalebone idol, a tombstone, a treasure box, and a decorated flute was later sent to the Heye Foundation. Mrs. George Heye, visited Catalina Island in 1920 with her husband, George Heye, founder and president of the Museum of the American Indian in New York, and also Harmon W. Hendricks, vice-president of the museum. Mrs. Heye helped in the excavations and found two perfect skulls on the island's isthmus. Arthur Taschenberger also accompanied Glidden to the desert island of San Miguel Island and they stayed for three months without finding anything besides 343 skeltons. He also followed Glidden to Santa Rosa Island. Glidden did not exactly dig in secrecy, so I am quite sure that the interested people could have a look at his findings in situ. His findings were published in the local newspaper, and since Glidden often is in the picture himself somebody must have taken the pictures. This also goes for the pictures of Glidden and large skeletons. And remember that this was a time without digital photo editing! Where are the bones of the giants that Glidden should have found? I have not been able to get the answers yet, but I am not at all sure he was lying or exaggerating to get money. For why should he want fundings for five expeditions and publications about his findings if he was lying; he would have been content with the annuity for his artefacts and secret! Some bones from Catalina and the other islands might in fact have been in museums but after the Protection and Repatriation Act they will have been removed and reburied. It is not that many years ago in historical perspective since Glidden according to the newspapers of the time sent hundreds of skeletons to the Haye Foundation and the Museum of the American Indian in New York. But the museums do not always have proper catalogues from that period: They will not be able to give a proper answer if they received artefacts and skeletons from Ralph Glidden. And if you send them an e-mail asking if they have any of Glidden's skeletons the easiest thing for them to do is just to ignore your e-mail. Especially if you ask about skeletons of giants! "Near the original surface, 10 or 12 feet from the center, on the lower side, lying at full length on its back, was one of the largest skeletons discovered by the Bureau agents, the length as proved by actual measurement being between 7 and 8 feet." It is of course better to ask about large human bones because museums will not use the term giants but even then I believe that you will have a hard time getting a proper answer. I have read archaeological reports and newspaper articles telling that large bones has been sent to the Smithsonian - even from their own field agents. But if you ask if they have any information about them you will just get the answer that they are not in their catalogues. The 10.000 dollar question is of course if Glidden sent the skeleton of the 9 footer he said he found to the Heyes Foundation. Might be not! His situation was not easy when it came to the economy and might be he chose to keep the cards close to his chest? Might be the skeleton is hidden someplace on the island? Might be he dug it down again to do further investigations? Well, the most plausible explanation might be that the skeleton crumbled to dust when taking the measurements. It seems that the largest skeletons found are the oldest - and reports of giant skeletons found all over the world tells that they disintegrated when exposed to air. It would be great if we could find the 9-footer but I believe that the chance is much bigger to find one of the 7-feet skeletons! At the moment we do not have any bones of the large skeletons that Ralph Glidden said that he found so the next best will be to take a look at the photos the exist. Glidden died in 1968, 87 years old. In Mach 2012 an unlabeled box was discovered in the Catalina Island Museum's archive. Here were many of the documents that Glidden had collected and kept - including heaps of photos. Terry with the tooth in the show. Unfortunately he had not at all been a methodical man so the photos were not marked and there were no information on where they were from and when they were taken. Nor were there any proper records of his excavations. Well some of the pictures have been uploaded to the internet and the most interesting is a photo showing Glidden digging up a very large skeleton. If this picture is a realistic and true verification of Glidden's finding it definitely shows that the man was not a bluff, even if his findings were sometimes sensationalized! Researcher and author L.A. Marzulli, who travelled to Catalina Island to take a closer look at the pictures says that he has had four people with forensic software to examine the photo and that they all conclude that the skeleton must have been 8 1/2 feet (2.60 m) in life. Marzulli also discovered that one of the skeletons on the on Glidden's photos had six fingers. This is very interesting because many of giants were said to have six fingers. Goliath from the Bible might be the best known, but I got into my 10 year long research on giants because I discovered that ancient stone statues on the island in the Pacific had six fingers. And that the same was to be found on ancient statues all over the world! Most often the depicted local gods that also were very tall; giants. "Search for the Lost Giants"
I was supposed to go to Catalina Island to be part of History Channel's new series called "Search for the Lost Giants", in an episode that ended up being called "The Giant Curse". I was supposed to be with the main-characters Jim and Bill Vieira to Catalina Island but ended up being filmed in the hospital instead! When I went out of the plane after the long flight from Australia I could not breathe and was rushed to the nearest hospital. Blood clots had moved from my legs to my lungs. The doctors told me that I was lucky to survive. Bill and Jim plus the film crew came to the hospital and we were making jokes about what the brothers called the "giant hunters curse". Well, it was only clever editing that made is seem like I thought it was something supernatural about giants and that a curse had made me collapse! I do not believe in curses and my point of view is that what we call giants was a species of Homo sapiens that were very tall, a race that died out. 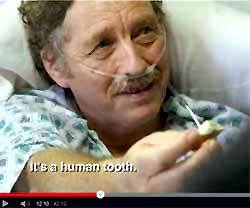 Many people seem to believe that I was cheating when I showed a tooth in the hospital bed; that it is a tooth from an animal and not a human. Well, the producer gave me the tooth just before the camera started rolling and told me it was a replica of the Denisova tooth. I am not a vet or a doctor, and I had no chance to check. I remember I thought it looked a bit different from the Denisova tooth I had seen picture of, but it was found two teeth in the Denisova cave and it might be a replica of the other one! I was very sceptical to be part of the series. I was afraid that they would dramatize too much and ridicule my research! But Jim Vieira is very serous about finding the truth about what we call giants, and I was hoping that the show could get the publics attention to what seems to be a not very known part of human history - and that I could be able to get the Denisovans into the picture. It was in 2008 that Russian archaeologists found a small bone fragment from a pinkie finger in the Denisova cave of southern Siberia. The finger bone was unusually broad and robust, well outside what is seen in modern people. They also found a tooth that was so large that the archaeologist at first mistook it for a cave bear tooth (and they found another tooth later)! Artefacts, including a bracelet, excavated at the same level were carbon dated to around 40.000 BP. It seems that in modern humans the frequency of Denisova DNA is the highest among North American Indians followed by Europeans. So I was very interested to go to Catalina Island to learn more about what Ralph Glidden had found there! What I am hoping now is that descendants of the first settlers to the USA after seeing the show will come forwards with old large bone that was found in Indian mounds or on the Channel Islands, so that they can be sequenced for DNA and dated before they are repatriated. Do you know something - or know somebody that might know something? Is there anybody out there that has personal knowledge of Ralph Glidden and/or his findings of large skeletons? Do you know something? Glidden died in 1968 and there should be people around that spoke to him about his findings on the Channel Islands. Was he bitter that he never could continue his excavations? Did he talk about his secret - about the blue-eyed giants and their lost temples on the islands? Might be it even might be somebody around who remembers seeing large bones in his tent-museum (even if it was closed for the public since the 1950s)? Are there clues where Glidden found the urn with the "princess"? What happened to Kay Brown; the young odontologist who was Glidden's assistant? Did Ralph Glidden have any children? Did Judge Ernest Windle leave any clues where he and Glidden found the almost 8 feet skeleton or did he write anything about Glidden and his secret? Does anybody know where Glidden found his largest skeletons? Yes, there are many questions but it might be important to find the answers. As Thor Heyerdahl of the Kon-Tiki fame said: "To say something about the future you must know the past"
About a decade ago I was teaching my eight-year-old son to skip rocks in the creek near our house in the Silicon Valley in California and he said "what's this" as he was holding up a what appeared to be a tomahawk head with braided rope marks embedded into it. At that point I inherited the ability to see the tools of the ancients all around us. A few years later we went to Catalina Island and I are starting to see many quartz points on the beach and some of the big triangular stones that are two handed axes over there. I couldn't believe the island very few trees very little water and almost no large animals could support Indians and then I read about the first European explorers to come to Catalina. I think it was Vasco de Gamma who said these tall blonde or red haired light-skinned people from Catalina came in their canoes lashed together like a barrel with 20 men rowing so fast they rode circles around the Spaniards ship while they were at full speed (Viking stunt). The technique of lashing together boards like a barrel to make a ship this way gave the Vikings dominance for 500 years because they didn't need harbors to go on to land, so I guess that the Catalinans could have descendants of ocean going Nordic people. De Gamma says they spoke to the birds, dolphins and seals to live in harmony. My theory is that these were the people the Aztecs called Quetzelquatl (lashed together planks on the ship sides would be described as the scales of a serpent as they slithered through the swells, and sails would be described as wings of a bird by the ancient mind: snake-bird gods that brought civilizing knowledge). Also, the Channel Islands are a good candidate for Lemuria, since there was a tribe known as the Lemurs on one of those islands. Absolutely. What a find. The Smithsonian. Hide. All. These from the public they don't want Us knowing the TRUTH!!! Very interesting. I always thought that giants had six fingers in their hands and feet. It made sense if you think of the size of their feet and hands. The Sumerians used the 12 as a measure. We presently buy a dozen eggs in the stores. Why not 10 eggs? We have 5 fingers in each hand and feet. One foot equals 12 inches. Why not 10? My hypothesis is based on what we take for granted. The bible talks about the Nephelin and the Sumerians made reference in their clay tablets of Giants too. Makes you think that what we call history is quite skewed. The pic of our intrepid hero is s fake. The original is available in the SB Museum site: he's not in it. Absolutely believe! The Mounds of America! All shells were from middens (Figure 22) with the exception of a sample which the Indians had placed in a cemetery containing over 100 skeletons. These skeletons had been buried in sitting positions with knees drawn up under their chins. Each skull had been painted a brilliant red which gradually faded on exposure to the air. Three of the skeletons were from strong people over 7 feet tall (Figure 23).